Considering the popularity of World of Warcraft and other MMO games, developers everywhere are trying to figure out how to make the gaming experience more real for the gamer. This is where devices like the jDome come in to play. 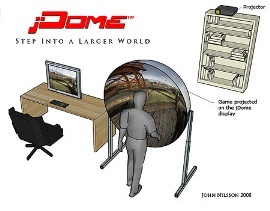 As you can see, the jDome is a giant semispherical display that allows a gamer to see a semi-realistic 180 degree point-of-view of their player character. The jDome is made of a transparent material that allows images to be projected upon it. According to the picture, that projector must be placed at the height of a bookcase. I’m not certain why the jDome is set up for a person standing rather than sitting, but perhaps that is to make it more real. If that is the case, then the player needs to have some sort of treadmill, ball, or something to stand on that would allow him or her to move around in a stationary position while they are fragging. I think it is important to note that jDome’s slogan, “Step Into A Larger World”, echoes a certain line uttered by Obi-Wan Kenobi in Star Wars. I believe he was referring to the Force, but I’m not certain that the jDome is as phenomenal. We shall see. Unfortunately, the jDome is still a design by John Nilsson. When it does get developed, the designer estimates a consumer cost of about $125-200. The iDome does the same thing but higher quality and no distortion. Of course it’s somewhat more expense …. still just one projector.